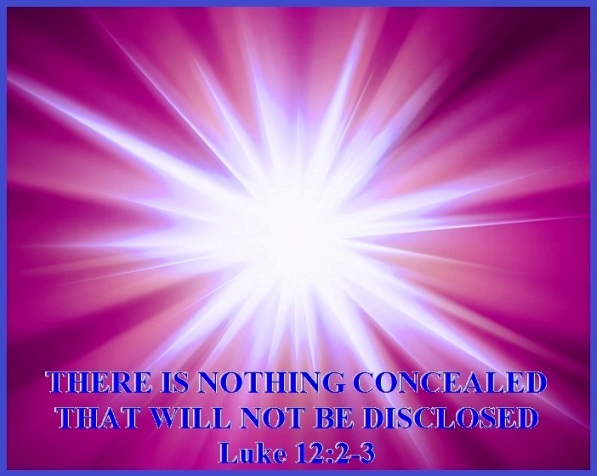 In these verses Jesus is clearly telling us that nothing that we do is concealed from God and everything will be disclosed. Even things that we do in secret and that only we know about, which we think is well hidden will be made known. Paul says in 2 Corinthians 5:10 that “we must all appear before the judgment seat of Christ, that each one may receive his reward, according to what he has done, whether good or bad.” And Romans 2:6 tells us that God will render to each man according to his deeds. There are many people in the church today who are claiming to be a follower of Jesus, but who are covering up their secret sins. They look good on the outside and have the appearance of a Christian, but when they are alone they are engaging in things that are sinful and wrong. Many think that they can get away with things as long as nobody finds out about them. However, while sin may go unnoticed by man, we can be assured that it does not go unnoticed by our Sovereign God and one day we will be judged accordingly, either at the Judgment Seat of Christ or at the Great White Throne Judgment. In verse 3 we read: What you have said in the dark will be heard in the daylight. What you have whispered to someone behind closed doors will be shouted from the rooftops. Did you know that every word you say is being recorded in heaven? The Bible clearly teaches that liars shall have their part in the lake which burns with fire and brimstone. Your lies are being heard and recorded in heaven. Where will you stand on that Day of Judgment? Will you be condemned by your words? Or will you be acquitted by them? The truth is, whether you believe it or not, every one of your whispered words, those that you think no one hears but those to whom they are directed, will be echoed loudly in the judgment hall of God. You will be held accountable one day, so be careful what you allow into your mind. Be careful what you watch. Be careful what you listen to. Be careful what you read. Be careful what you look at. Be careful how you present yourself and be careful what you say. Paul tells us in Philippians 4:8 to think on the things that are true, honest, just, pure, lovely, of good report; virtuous, and praise-worthy. If we guard what we allow to enter our mind our life is going to be so much better and most important of all, it will be pure and pleasing to God. Today we are judged by others simply according to what we do. The words that come out of our mouths, the places that we go; the actions that people see us do. But a day is coming when every private thought will be exposed. Every hidden desire, every lust, every passion, every motive, every rebellion, every attitude, every thought of the heart will be revealed. In this ministry we want our thoughts, motives, attitudes and desire to be pure. How about you what do you want to do? There is nothing covered that will not be revealed, however, there is good news, because Jesus said in John 3:17, I didn’t come to condemn the world. If you’re living in sin you’re condemned already, but Jesus came that He might bring salvation and forgiveness. Faith in Jesus Christ as the Savior is the only “step” to salvation. The message of the Bible is abundantly clear. We have all sinned against God (Romans 3:23). Because of our sin, we deserve to be eternally separated from God (Romans 6:23). Because of His love for us (John 3:16), God took on human form and died in our place, taking the punishment that we deserve (Romans 5:8; 2 Corinthians 5:21). God promises forgiveness of sins and eternal life in heaven to all who receive, by grace through faith Jesus Christ as Savior (John 1:12; 3:16; 5:24; Acts 16:31), and make Him the Lord of their life. If you need to be cleansed of your sins, why don’t you bow your head and allow God to do that work in you today?